Decoupage a wooden potpourri box with dried pansies or other dried flowers, then fill with fragrant potpourri for a great homemade gift. 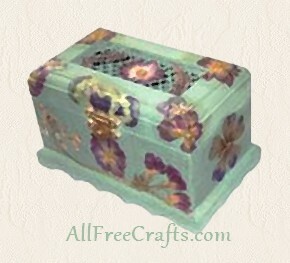 I chose a pansy theme for this little wooden box, but any small, flat pressed flowers, or an assortment of flat leaves or flower petals, would work for this easy decoupage project. 1. 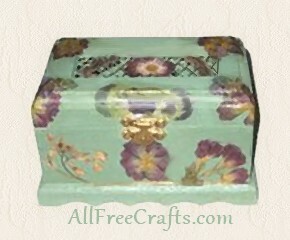 Base paint the wooden box, including the wire inset, in the color of your choice. If needed, apply a second coat. Let the paint dry. 2. Assemble an assortment of pressed flowers and leaves. Select some flowers and try a trial run, arranging the flowers on the top, or the side of the box, to see what they may look like when glued in place. When you have a pleasing arrangement, set the flowers down on the table in the order that you will be using them. Apply a small amount of decoupage medium, or thinned glue and water, to the area of the box where you will place the first flower. Pick up the flower and brush decoupage medium on the back with a small soft brush. Gently apply the flower to the box, smoothing it down with the brush. Coat the top of the flower generously with decoupage medium. Continue placing the rest of the flowers, applying decoupage medium as you did with the first blossom. 3. Repeat Step Two with each side of the box where you plan to apply flowers. 4. Once all flowers are in place, brush the entire box with a coat of decoupage medium or thinned white glue. 5. Apply one or more coats of craft varnish or sealer, or another coat of decoupage medium, until the box has a satisfactory matte or gloss sheen. 6. Fill the box with potpourri.